They always say- write about what you know. Strange really when you apply that to some best selling fiction. Did Frank Herbert know about space travel and the politico-religious structures of far-flung empires when he wrote ‘Dune?’ Did Martin Amis live his life backwards, as in ‘Time’s Arrow,’ and is J.K. Rowling regularly seen running through a pillar on a railway station platform? Of course not. J.K. worked out that she would save a fortune in reconstructive surgery by leaving that sort of stunt to the imagination. Now of course imagination is essential to good writing, but is a work ever one hundred percent imagination? There is a school of thought which says that all writing is autobiography. You probably couldn’t extend this to shopping lists, but I can see what they mean. What I am getting at is that for some reason we are a part of the universe which has been gifted or cursed with self awareness, and as such we are constantly processing information, trying to make sense of it either through science, through art, through music, maths or literature. Somewhere back in the mid nineteen nineties I had just finished my Master of Philosophy thesis on ‘Who wrote the Gospel of John?’ After 60,000 words I had concluded that I didn’t know. I didn’t feel that it was a waste of time, because it was now an educated ‘I don’t know,’ and I had a piece of paper to prove it. But something was missing- big style. I was no longer writing. The poetry I had once written and performed no longer seemed to satisfy. Seeing 60,000 words bound, with my name on the spine, feeling the weight of it in my hands, oooohhhh…. I knew that I had to write a novel. Even as a child, this had been an ambition. At the age of thirteen I had tried to write a complex science fiction story, but had given up after several fase starts, realising that at that point I didn’t have the tools. I left college in 1984, with a combined honours degree in English and divinity. Things had happened there which I thought would one be the makings of a good novel. But again, I wasn’t ready, so what will one day become my second novel, ‘Legion’s Daughter,’ was placed on the back burner. The next ten years were taken up with making a career in the caring professions, and completing my M.Phil. Well I didn’t think I could pull off a biblical epic. But what about a book in which people with severe learning disabilities are major characters? In the mid eighties I had been involved in re-locating people from longstay ‘mental handicap’ hospitals. This was a world of which few people had first hand experience, and surely this quiet social revolution would provide a memorable backdrop for a unique story. Thus ‘Tasting the Wind’ was conceived. I’m at the stage now as a newly published author where I’m starting to get feedback from people who have read my book- some of them friends, others people I have never met who are e-mailing or writing reviews on my Amazon page. What is amazing me are the themes that some readers are picking out that are clearly there but of which I wasn’t aware during the writing process. I’ve also had comments about scenes which I didn’t think the strongest of the piece, but which some readers found the most memorable. I have gone to great lengths to differentiate between myself and Martin, the major protagonist. He is thin and freckly with ginger hair. I am not. He comes from a broken home, I do not. The only comparisons are that in creating Martin I drew upon my experiences of moving to London in the mid- 80s to work in care. I did work in an electronics factory for a short time, but that was in gap years between school, college and university. Writing about situations about which you are passionate is a little like exposing your soul to anyone who cares to look. When writing and publishing you do have to ask yourself if you are happy for absolutely anyone to be given a glimpse into your imagination, and if you can’t cope with that- don’t do it. Similarly, in this world of instant and widespread communication via the internet, people have been finding out the hard way just how public and accessible their jottings are. One man made critical observations on Twitter about Memphis, after he had visited in a business capacity, and this was picked up by his hosts, who were far from impressed. Another man commented about his new job that he was having to balance the size of the pay cheque against hating the work, and the comment was seen by his new employer. So if you are thinking about curling up with Allan Mayer tonight be careful how you phrase it. And don’t put it on Twitter- just send me a personal e-mail… and maybe your phone number…. It must be getting to me: the waiting, the constant search for new marketing ideas, the doubts about the quality of POD published books on some of the other blogs. Last night I had a dream that my book had arrived. It had cost me about £20. The publisher (YWO) had not used my book cover but some insipid torquoise creation, and pages were falling out. Now if Dean Koontz can write books in the name of his dog, I’m sure I can take time out to tell you about my furry friends. The little one, smudge, is now eighteen months old and has already fathered twenty little smudges- most of them with the nose markings which gave him his name. We decided to draw the line at twenty- or rather the vet did- a sharp line in a very tender place. Since then, Smudge seems to have lost his competitive edge when it comes to priority at the food bowl, but he seems happy enough. Fact is, when we bought smudge we were told he was a girl. 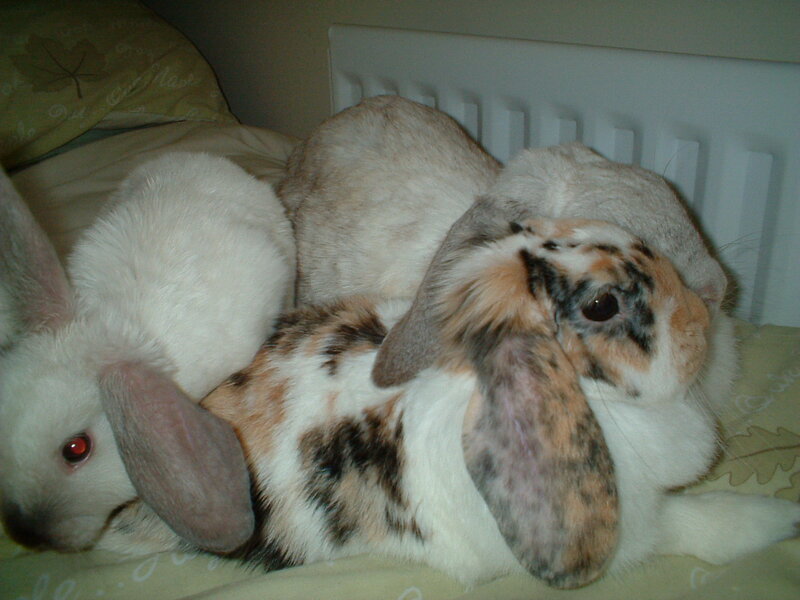 We had bought her/him to provide a friend for snowy when our first rabbit, Bonnie, died from a tumour. Then Snowy went the same way. One day I looked into the hutch. Smudge was lying on ‘her’ side, and I was shocked at what I saw. Surely we weren’t going to lose a third rabbit to a tumour in such a short time. Then I looked closer, the cogs in my brain began to turn, and I realised that a long fleshy object between a rabbit’s hind legs is not necessarily a tumour. Next thing, Tilly was pregnant. Unfortunately she died giving birth, and left two babies. 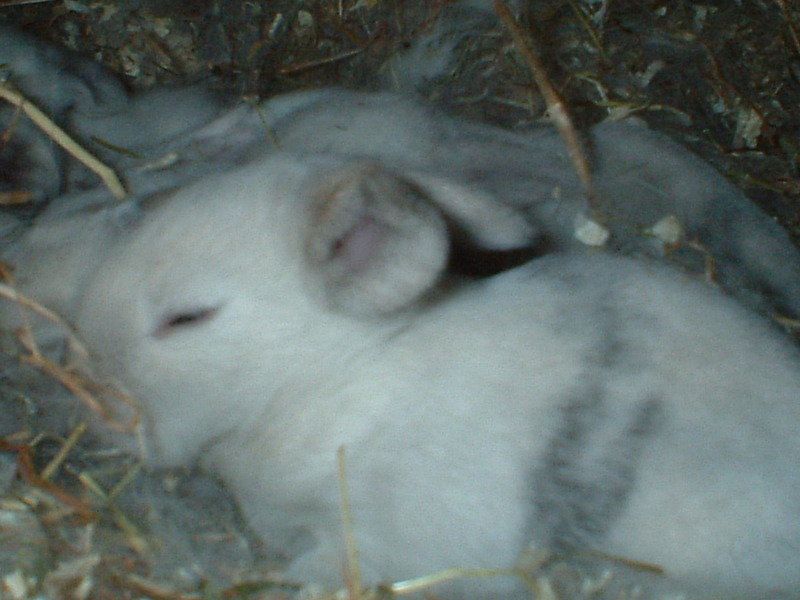 The success rate of hand-rearing is miniscule. We tried, but they only lasted a week. We missed having Tilly in the house, as she was one of the most ‘spirited’ rabbits we had ever known. The house is ‘rabbit proofed’ but one day when Tilly was in the kitchen we heard a large crash. Tilly had jumped onto a chair, from the chair to the table then onto the top of the hutch- where the treats were kept. We got to the kitchen to see a guilty looking Tilly scampering across the table, and a very happy Snowy helping herself to the contents of a packet of bunny-chocs which were scattered across the kitchen floor. Keeping a succession of house rabbits has taught me that each one has its own distinctive character. We now have Smudge, Dusty, and their baby, Brandy. Each one is totally unique in character, but as yet not one of them has demonstrated a talent for novel writing. PS: Is it Legend Press, Lightening Source or some other printer who will print our books? I’ve just received an email from Dominic Took, author of ‘Storms of Acaias’ about an arts council project through ‘You Writeon’ to publish the first 5000 writers to apply. I responded, and have been accepted, so if things go to plan ‘Tasting the Wind’ will be available in paperback by Christmas. The only references so far that I’ve found on the net are from the states. They are asking if it is ‘Print on Demand’ similar to Lulu. It does appear to be so, as the paperback is only available through the website or, if you pay a small fee, from Amazon and certain bookshops. Significantly, some of their authors havde attracted the attention of bigger publishers, and part of the contract is that you are not bound to Writeon if any mainstream publisher notices you. So I am trying it out. Watch this space. Alcohol- the cause and solution of all our problems, as Homer Simpson once said. There is a strange relationship between alcohol and writing, a stereotype which goes something like this: the tortured author, poet, or hack, sitting in his garret over his typewriter (wordprocessor doesn’t quite fit this ‘romantic’ image) churning out volumes of original thoughts, his creativity enhanced by the juice of the barley or grape or whatever comes to hand. The epitome of this is perhaps the poet, Dylan Thomas. Apparently when asked what he liked about being drunk he said something like ‘because it’s different everytime,’ (Thomas fans please correct me- it usually happens when I mention a writer I know little about!) Funny that- I like a drink but to me the aftereffect is sort of samey most of the time. Stephen King in ‘On Writing’ does a lot to explode the myth about alcohol and creativity, in a passage which is well worth the read to see how a truly successful author recognised and conquered the demon. Truth is, if you write something whilst under the influence you will probably feel that you have just written the most original and creative piece in the history of writing. Until the next morning. Although I have never had an ‘alcohol problem’ I would be lying to say that I don’t enjoy a drink. Recently I went for my ‘middle-aged fat boy test’ (or Glucose tolerance test as they call it) and was found to be prediabetic. This means that I have had to make some lifestyle changes.
. It tastes like shite, so one can will last you all night.